You can make your own horizontal pressure guards by cutting the end of a softwood board at about 45 degrees and putting a number of closely-spaced sawcuts in it. I used a bandsaw, but a tenon saw will do the job. The boards are clamped to the table top or fence. To prevent them moving under the force of the workpiece, a length of batten can be clamped with its end against the pressure guard. 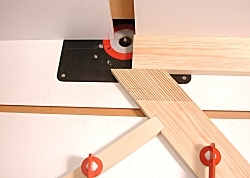 The job can be improved by cutting a notch in the pressure guard to take the end of the batten. See Ron Fox’s Routing Tips no. 26 (Building a Router Table part 9) photo 50, which shows vertical and horizontal pressure guards on a router table.